This is the book Jacqueline Wilson was born to write. Born, in the sense that it is her first fiction to feature a child of the 1950s, as she herself was. And as you might expect, she pulls it off splendidly. Like a hanky drenched in the Coty’s L’Aimant perfume favoured by the mother of its heroine, Queenie positively reeks of a seemingly far off era when TB was the blight of many children’s lives. And yet the immediacy of its telling reminds present day young readers that it is also a time very much in living memory, over which our own same Queen presided. Elsie Kettle lives in a small basement flat with her beloved Nan, the mainstay of a life into which her glamorous but flighty mother flits only occasionally. It is 1953, and Elsie and Nan are excitedly planning a trip to London to see the Coronation. But then disaster strikes when both grandmother and granddaughter contract TB, and whilst Nan ends in a sanatorium, in a bad way and coughing up blood, Elsie is dispatched to a children’s orthopaedic hospital. With months of bed rest on the cards, a traumatised Elsie struggles to adjust. But she soon befriends kind Nurse Gabriel, and Queenie, Blyton Ward’s majestic white cat, and before long she is cheering up the other children by telling them magical stories every night. Sadly, Elsie has to miss the Coronation. But one day shortly afterwards, a very special visitor arrives. This is not Jacqueline Wilson’s most compelling story, and nor does it have the raw urgency of many of her contemporary dramas, although Elsie’s floozy of a mum is a fitting 1950s counterpart to the neglectful mother in Lily Alone. But as an engaging and touching evocation of the period, it is a consummate treat. Reading it is like curling up with the satin beribboned box of chocolates, given to Elsie by one of her ‘uncles’. The story is crammed throughout with other delicious period details too: tinned peaches and evvapy milk, Frankie Vaughan, Tizer, Muffin the Mule, Butlin’s and Girl comic (revealed in Jacky Daydream as Wilson’s own favourite). From “the wind might change and you’ll be stuck like that”, to “she’s no better than she ought to be”, Wilson has also trawled her childhood for amusing turns of phrase of the day. Yet at the same time, she also manages to provide her young readers with a remarkably detailed crash course in child orthopaedics, and a sobering account of a time – not so long ago - when modern medicine still hadn’t conquered TB, and many children were doomed to walk in callipers. 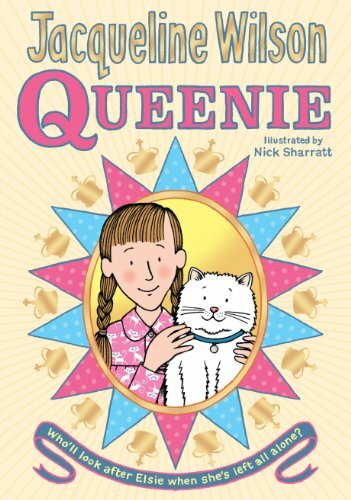 Queenie is the perfect book to share with a grandparent who remembers the 1950s first-hand. And, enrobed in one of Nick Sharratt’s most scrumptious cover treatments to date, it’s a fitting Coronation commemorative too.